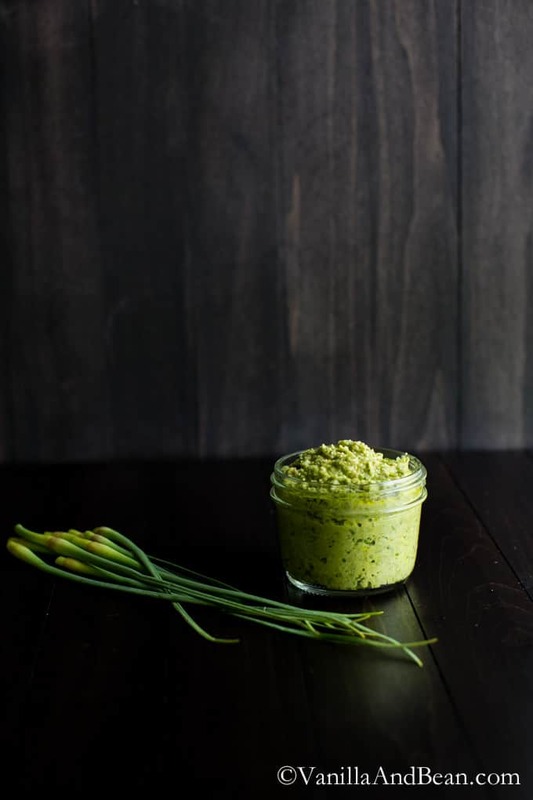 Year round pesto awaits in this easy, Vegan Garlic Scape Pesto Recipe. Find garlic scapes at local co-ops, CSAs or farmer’s markets. Use it on your favorite pasta, pizza, sandwich or soup. For a cheesy garlic scape pesto recipe see my adapted version here. 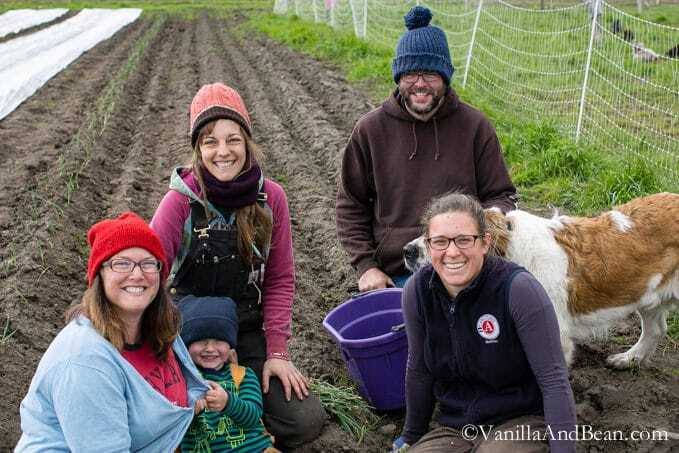 Before I share about the Garlic Scape Pesto, I want to introduce you to a very special family and the farm they call home. It is this farm, among several others, that provide our community and beyond with a bounty of fresh, organic veggies and eggs throughout the growing season. Prairie Bottom Farm is a 20 acre farm that sets in the Ebey’s Landing National Reserve. It’s a stone’s throw from the Port Townsand-Coupeville Ferry and is nestled in the heart of Whidbey Island, about two hours North of Seattle. They are a vital resource to our community not only providing access to fresh veggies and eggs, but they are a part of a collective of small, organic farms here on the Island that foster sustainable care of the land, people and animals. Currently teaching and farming, Wilbur is a 5th generation farmer, on Whidbey Island. Julieanna grew up working the farms of Skagit Valley, yet college and a subsequent professional career took her away from farm life. She returned to farming full time five years ago, leaving the corporate world, putting her skills and energy into her and Wilbur’s farm. Together, they’ve been farming Prairie Bottom for seven years. Prairie Bottom full-time farmer, Janiece said “I was only going to stay for 6 months, and I’ve been here for five years!” Kimbra and Brandon (not pictured) are both farm interns. And that cute little guy, Henry, he joined the farm five years ago. Perhaps he’ll be running Prairie Bottom in the future (6th generation?)? I visited on a very cold, blustery, grey day in April to talk with the farmers. The wind was gusting from Puget Sound and across Ebey’s Prairie. 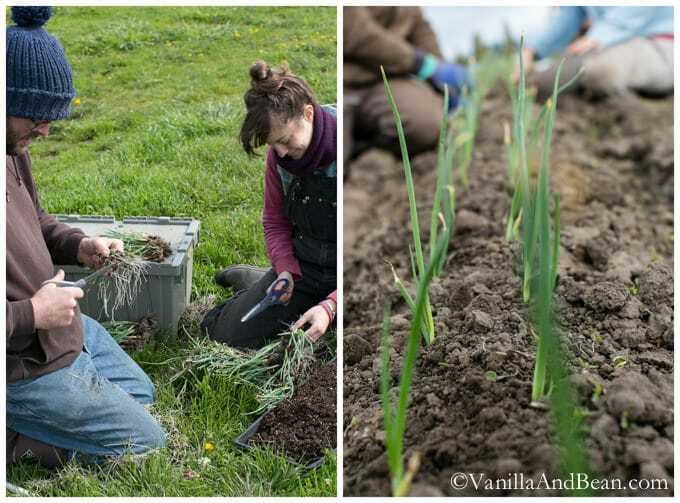 Despite the blustery weather, the farmers were planting sweet onions. The 70-some free range hens, roosters, and Tom turkey didn’t seem to mind the cold. Kimber was on her second trip, out of four, to collect eggs. I took a short break in the warmth of the hoop house (green house) where I found rows of seedling planter boxes which included tomatoes, peppers, peas and romanesco, among others. Prairie Bottom Farm is the farm Rob and I purchased this year’s Community Supported Agriculture Share (CSA) from. We purchased a partial, or 3/4 share, because last summer, we found a full share was just a bit too much for the two of us. We purchased our share early where we saved about 10% on what a share would cost if we had waited to buy it now. Even if we missed this window of savings, the benefits of purchasing from local farms exceeds any monetory savings of sourcing food elsewhere. I’ll be talking more about the benefits of supporting local farms, eating locally produced food and more about Prairie Bottom next week. Until then, lets talk about these gorgeous scapes, direct from Prairie Bottom Farm! Scapes may be challenging to find, although I have seen them at co-ops, farmers markets and through CSAs. They have a short season in the Spring, so if you see them, buy them up! They have a delicate yet pungent, spicy, garlicky flavor. This recipe is so easy to whip up. It is vegan, however, if you’d like to try a cheesy version, try my Garlic Scape Pesto with Pecorino. I typically make multiple jars of pesto, in small batches, and freeze it to enjoy throughout the many months scapes are no longer in season. It can be used like any other pesto but my personal favorites include using it on pizza, crostini, stirred into soups, on pasta or in this Creamy Farro with Asparagus and Peas recipe. Do you know where to find your most local farm or farmer’s market? If not, check out Local Harvest. It’s an excellent resource to find local food! Year round pesto awaits in this easy, vegan, pesto recipe. Find garlic scapes at local co-ops, CSAs or farmer's markets. Use it on your favorite pasta, pizza, sandwich or soup. Trim the garlic scapes by cutting just below the bulb. Discard the bulb/tip and cut the scapes in about 1" pieces. 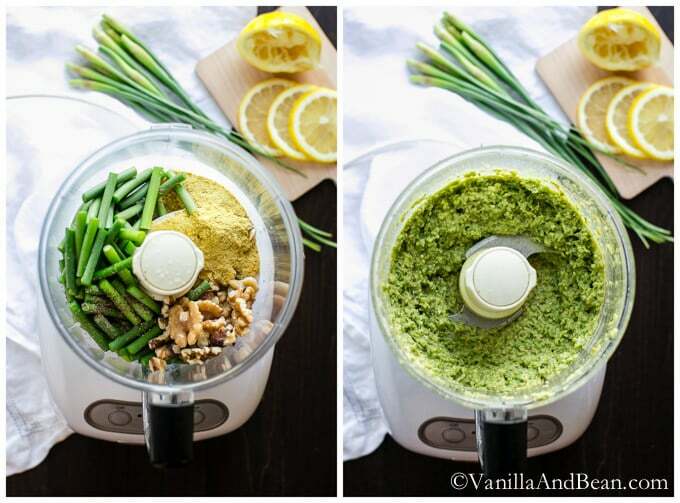 In a food processor, add the scapes, walnuts, yeast, lemon juice, salt and pepper. Process by pulsing until the mixture begins to break down. Scrape the bowl down. With the processor running, slowly add all the olive oil. Continue to process until all the ingredients are incorporated and broken down, about 30-45 seconds, stopping to scrape down the bowl as needed. Store in a covered container in the fridge and enjoy within a week. Also, you can freeze the pesto in a jar or in an ice-cube tray. Once frozen, in the ice-cube tray, remove and place in a ziplock bag in the freezer. Recipe adapted from my vegetarian, pecorino Garlic Scape Pesto. Would it work with cashews instead of walnuts? Hi Valerie! I’ve not tried it with cashews but you could give it a go! I’m sure it will be delicious. Please let us know how it turns out for you if you give it a go! I ended up using almonds and it worked great!! Also – I froze most of it but have had some in the fridge for about two and a half weeks. Do you think that’s still good? I know you said a week but I’m not sure what would go bad in it? Hi Valerie! Thank you for coming back and leaving a note! So happy you enjoyed the pesto and with almonds (delicious!). I just tend to freeze things quickly if I don’t use them up, so I’ve not tested the pesto beyond a week in the fridge. You could nose it a and see what you think. I hope this helps! I liked this recipe overall, but it was a little too garlicky for me. I added nutritional yeast, more oil, salt and basil to balance the flavors a little. Thank you for your note, Shelby! No doubt, garlic scapes are garlicky! So glad you were able to adjust it to your taste. Made this a few days ago and brought it along to our cabin for easy dinners. So far have enjoyed it on pasta and loved it on home made pizza dough with a little fresh basil, tomatoes and sweet pepper for toppings! Thanks so much for the great recipe! PS made it with walnuts because you’re right ~pine nuts are crazy expensive right now and tastes just as delicious with walnuts! Hooray Heather! So happy you’re enjoying the garlic scapes. Thank you for your note and recipe suggestion! Your homemade pizza sounds absolutely fabulous! And pass the walnuts, right!? We harvested about 150 garlic scapes today and were once again on the prowl for a way to use them. My hubby found your website and made this recipe for us tonight. We were both thrilled with the results! It was fast, delicious and easy. We didn’t have walnuts in the house so substituted pecans which certainly didn’t seem to harm this recipe. I will be making your “Creamy Farro with Pesto Asparagus and Peas” tomorrow. Thank you so much. Can I make this using frozen scapes? I froze them right after buying, and am hoping to make this recipe! Thanks! Hi Natasha… I don’t see why not.. I’d thaw them first though. I hope you enjoy the recipe! In response to Natasha’s question. We used up all of our fresh scapes and have had to move on to those we froze last summer (this has been a very popular recipe in our house)! My husband made a single recipe tonight to see how the frozen would compare to the fresh. The garlic flavor is diminished somewhat using frozen but otherwise we found very little difference. To compensate we added a small slice from a fresh garlic clove. We have served this pesto very frequently in the past 5 weeks and have had very positive responses along with requests for the recipe. Hi Traci! 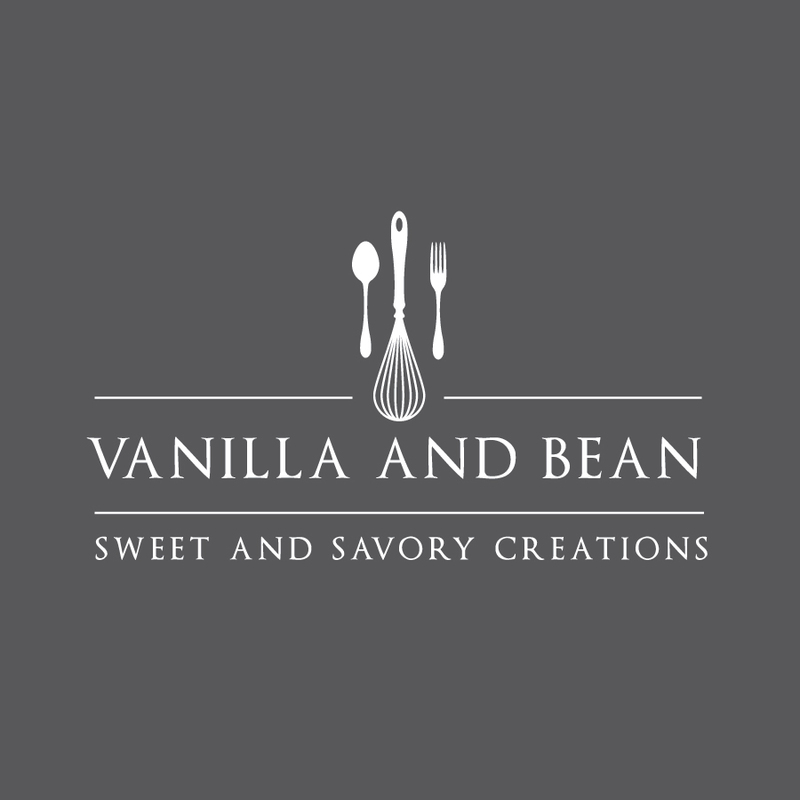 I just discovered your site today via MJ and Hungryman! Your blog is beautiful – I absolutely love the light in your photos!! :) So glad I discovered you today! I’ve never been able to get my hands on fresh scapes but have always wanted to try them. They sound so delicious! What an amazing farm! I loved reading more about their story. And this pesto looks unbelievable! I’ve never cooked with garlic scapes but this is making me want to give them a try! Nutritional Yeast in PESTO!!! That’s a brillian idea! Love the read and gorgeous images! I never have actually tried scapes before as they are a little tricky to find here in Australia, but this pesto sounds divine Traci. What a lovely story to share with us, Traci! It’s so special that you got to go out to where your food is growing and visit with the folks who put in so much time and effort making it for you. I’m embarrassed to admit that I’ve never cooked with scapes, but I must try this scape pesto soon! I love the tip about freezing pesto – it makes for easy weeknight meals when you’re short on time. Love Love LOVE the post, Traci! You’re such a beautiful writer, and with your words (and gorgoues photos) you made me fall in love with the Prairie Bottom Farm! 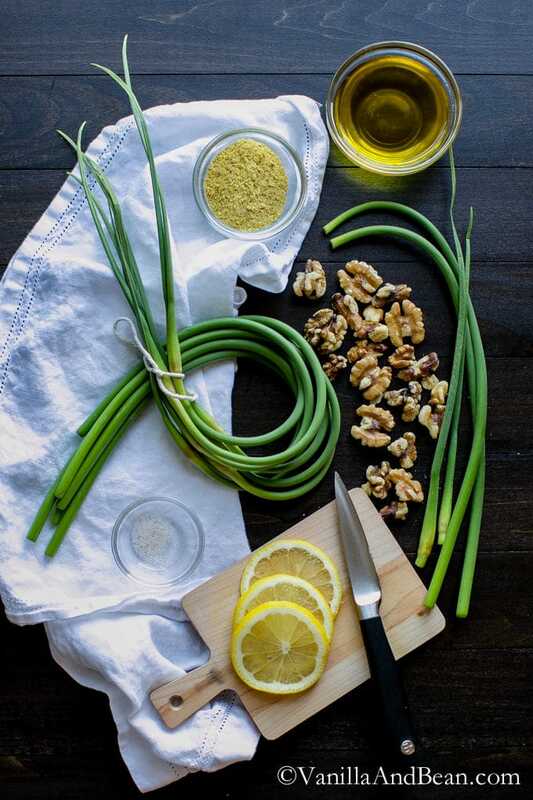 I seriously need to cook more with garlic scapes…beginning with this recipe! Awh, Min, thank you my dear! That means so much to me. :D Yes yes! Find some scapes! You’ll love em’! Traci! I just love these photos and this story. Makes my heart happy! And that garlic scape pesto! Yum. I want to slather it all over a grilled pizza right now! Thank you, Liz! Now my heart’s happy! :D This would be perfect on grilled pizza! Yum! What a wonderful farm. You know it’s good when people say they had no intentions of staying but then couldn’t get enough of it! And thank you for this pesto. It’s scape season for sure and I want to put them in EVERYTHING! I’ve never had scape before, I really hope I can find some, this pesto recipe sounds so delish! Love that it’s vegan! I will definitely have to check around for scapes. I’ve never used them before, but this recipe is too yummy to pass up! Desperately hoping that I can find scape somewhere in London! It looks so vibrant and fresh and I love the use of walnuts too. I adore these pictures, and this pesto sounds fab! Garlic scapes are SO full of flavour I can only imagine how fab this tastes! I’m so glad you went to Prairie Bottom Farm Traci! I’m sure it was a great experience! And there is nothing better than cooking with fresh produce. I recently tried walnut pesto and it turned out great! Now I need to find some garlic scapers and try your recipe! Oh, I couldn’t agree more, Mira! Fresh produce makes me happy! Walnuts in pesto? Who knew! I love it too. :D I hope you find some scapes and whip them up! The first time I experienced garlic scapes was about a year ago when my husband brought home a beautiful tangle of this magnificent herb. I used them to make a frittata, which was divine, so you can imagine my excitement when I saw this post. Of course I love everything about it. 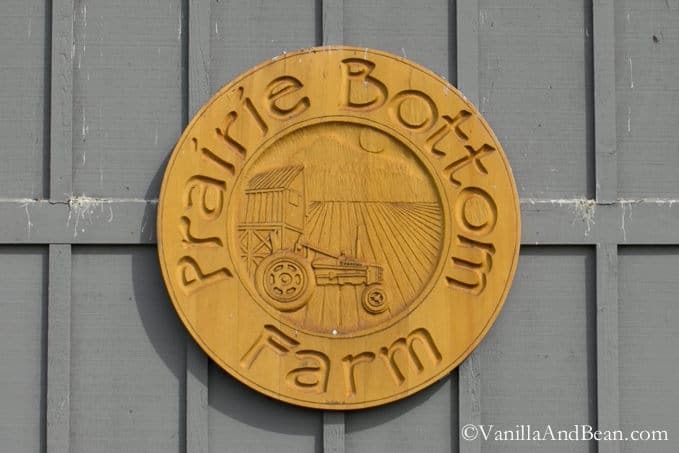 Your photos and story about Prairie Bottom Farm is the stuff I love! What a wonderful addition to your community and life! Thanks for sharing, my friend! Have a beautiful weekend! Oh isn’t it divine?! Oh, now a frittata sounds just fabulous with scapes! I’ll have to give it a go! More to come on PBFarm. It’s such an important place in our community! Delicious recipe! You have inspired me to look into participating in a CSA. Beautiful post, Traci! I buy scapes at my farm market here in ny every year and always keep them in a vase in water for a few days before I use them because they are so pretty. But not as pretty as your photos! 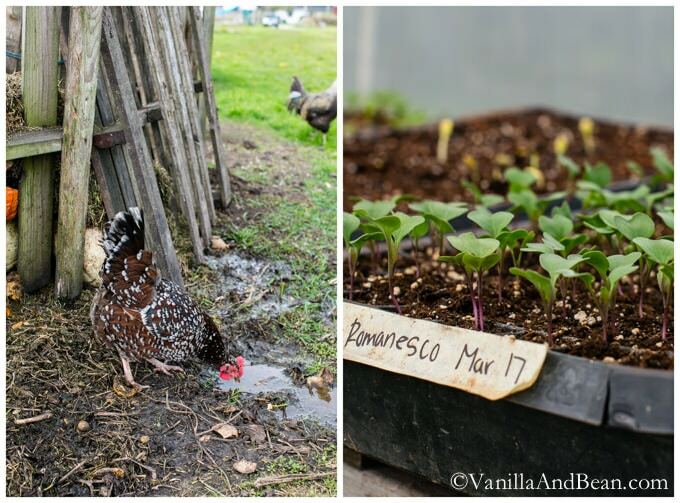 This is beautiful… your story and photos of the farm -I love it! I don’t think I’ve ever tried scape, but I definitely want to now!! <3 Gorgeous post, Traci! I love reading about local farmers and Prairie Bottom Farm looks like they are doing a great job! We used to be part of a CSA until we built raised bed gardens on our own property. I love growing fresh produce to make delicious recipes like this pesto. I love that you made it vegan too! Love this post, Traci. It’s so wonderful that you took the time to make a trip and learn all about the farm that you received your CSA from. I haven’t tried a local CSA yet but I do try and buy from the farmer’s market each weekend for as much produce as I can – I think it’s important to try and buy locally and supporting my local farmers. I’m also making a big push to eat organic. It used to be much more expensive but the organic produce, while a bit more costly, is now much closer in price to regular produce. Looking forward to trying this pesto recipe! Thanks. Thank you, Geraldine! I absolutely loved learning how PBFarm operates and the history behind it. So much goes into the food we eat, and often times, it’s not even given a second thought. I hadn’t been a part of a CSA until last summer. Before then I had always gone to the farmers market too (and I still go to supplement when needed and its fun to go anyway)… but I decided to jump into a share and its been so much fun! Good for you, for eating organic!! YaY!! The prices are becoming more competitive, perhaps because demand has increased, maybe production has as well? 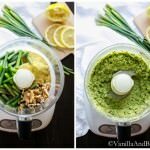 Wow this garlic scape pesto looks positively delicious! And I loved reading about Prairie Bottom Farm. I think that’s so amazing that you have the opportunity to participate in a CSA program like that – it makes such a difference in terms of the type of food you consume and what you’re doing for the local environment and farmers. I also admire families like those of WIlbur’s for putting the love, dedication, and hard work into creating the chance for the rest of to live more sustainable, healthy lives. Beautiful post, Traci! No doubt about the amount of dedication, planning and heart that goes into PBFarm. It’s all encompassing. Oh yes, the food is incredibly fresh and it just taste so good! I was hesitant when I first joined a CSA, because I didn’t know what the heck to do with Mustard Greens or Fennel or… or… but it really has forced me to try new things and step outside of my box. It’s been a gift. :D Thank you, Beeta! 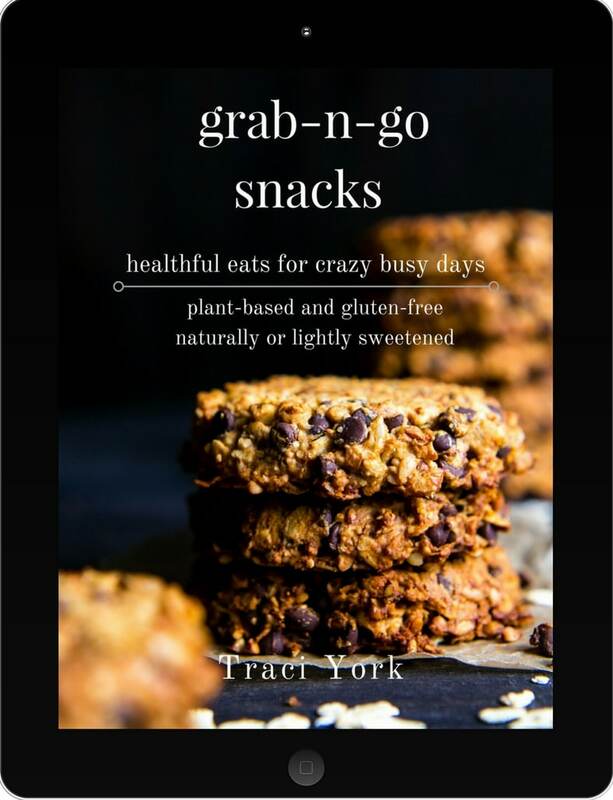 Wonderful post Traci….great story, great recipe! Loving this garlic scape pesto! Just amazing Traci! Anyway, your pesto recipe is simply wonderful and I’ll definitely try it. I’ll keep you informed! Absolutely loved this post and especially the treat of meeting the Prairie Bottom Farmers. Showcasing their warmth and work keeps us connected to the land and reminds us of how lucky we are to still have dedicated individuals working it for us. I appreciate seeing the generations — with the youngest apprentice Henry on hand — and of course Zuza completing the circle. Thank you for bringing this smile to my day Traci! (Henry also happens to have been my dad’s name so I’m feeling especially lit up seeing this smiling young chap this morning). I look forward to hearing more about the farm and your CSA goodies in future posts. And as for your garlic scape pesto, well, I’ll I can say is that I now desperately want to find a corner in my garden to plant garlic! (I’m hoping it’s not too late). Walnuts may be my fave nut — great use here with the lip-smacking lemon. Is it crazy that I want to eat this for breakfast? :). That first photo Traci… stunner. First of all this pesto is bananas amazing. And secondly, I love this post. Such an intimate and wonderful view into this farm. Awh, thank you, Jocelyn. The farm… I love visiting and it’s so nurturing knowing where our food comes from. Pesto is a wonderful thing to throw on pasta – or toast – as soon as I know what SCAPES are and whether i can get them here, i shall make this – and tell you – how good it tastes! Hello Margret! Oh that’s great – I hope you can find them! Traci, pesto is a favorite of mine not only on pasta but sandwiches too!! Very interesting post! Can’t wait to try this recipe!